Kurt Vile released a new album, Bottle It In, back in October via Matador. It was one of our Top 100 Albums of 2018. 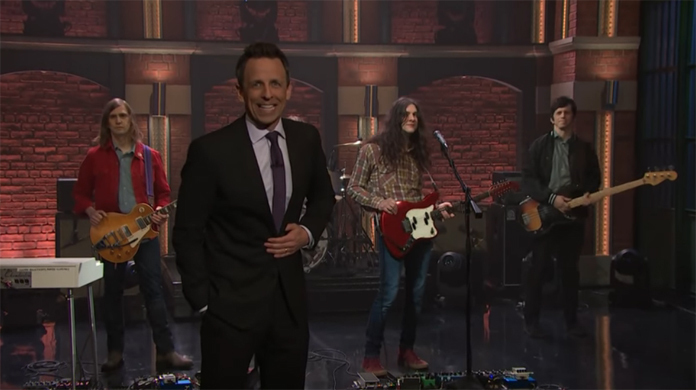 Last night he stopped by Late Night with Seth Meyers to perform the album's "Yeah Bones." Watch the performance below, followed by Vile's upcoming tour dates. Bottle It In includes "Loading Zones," a new song Vile shared in August via an amusing video for it (it was one of our Songs of the Week). When the album was announced Vile shared the near 10-minute long "Bassackwards," via a lyric video for the song. "Bassackwards" was our #1 Song of the Week. Then he shared another song from the album, "One Trick Ponies," via a lyric video for the song (it was also one of our Songs of the Week). He also stopped by SiriusXM to cover Tom Petty's "Learning to Fly" and perform "Bassackwards." Plus he stopped by Jimmy Kimmel Live! to perform "Loading Zones." He also shared a non-album track, "Timing Is Everything (And I'm Falling Behind)," which was an Amazon Original. Vile also stopped by NPR Music to perform three songs as part of their Tiny Desk Concert series, where he did "Bassackwards," "Loading Zones," and "Peeping Tomboy." Bottle It In is the follow-up to 2015's b'lieve i'm goin down..., although last fall Vile teamed up with Courtney Barnett for a collaborative album, Lotta Sea Lice. Bottle It In was recorded over the course of two years in various cities (including Los Angeles, Brooklyn, and Portland), with various producers (including Rob Schnapf, Shawn Everett, and Rob Laakso, a member of his backing band The Violators). The majority of Bottle It In was recorded at Tarquin Studios in Bridgeport, Connecticut, with Peter Katis (Interpol, the National) engineering and producing. The album also features Cass McCombs, Kim Gordon, Mary Lattimore, Lucius, Warpaint's Stella Mozgawa, and Farmer Dave Scher.